We searched long and hard for a black huacaya male to add to our herdsire row. We knew we wanted a male with fine, consistent, black fleece, no white markings, excellent confirmation and a solid genetic background. The instant we felt Champ's fleece we knew he was the one. With KPR Legend's Challenger as his sire (one of the best grey herdsires in the country who commands a $7500 breeding fee) and both MFI Peruvian Black Mesquite and Peruvian Aladdin on his dam's side Champ has an excellent combination of high end black and grey genetics behind him. The handle of Champ's fleece is just amazing and he is now starting what promises to be an excellent show career. Champ's show career is looking good. 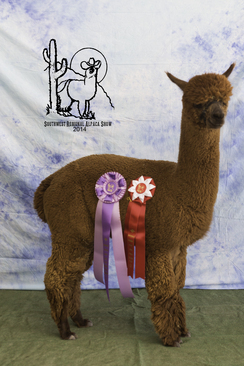 In 2009 Champ debuted at the OABA AlpacaFest and took first place under judge Jude Anderson. A contender in the black color champion class at that show, despite several examinations by the judge Champ did not receive the championship. At the TxOLAN Alpaca Spectacular he took not only first place in a very competitive Black Male Yearling Class but also the Black Male Color Championship, standing over 11 time Color Champion Irish Meadows Peruvian Knight Rider! At GWAS in another very competitive class he took 3rd Place. This boy is standing up with the winners where he belongs. Champ has now started his breeding career, we have bred him to some of the top girls in our herd and are just awaiting pregnancy confirmation. This is an outstanding male who is sure to add quality and value to your herd. River's fleece has a luscious brightness and a very soothing handle - unusual softness in a dark fleece. 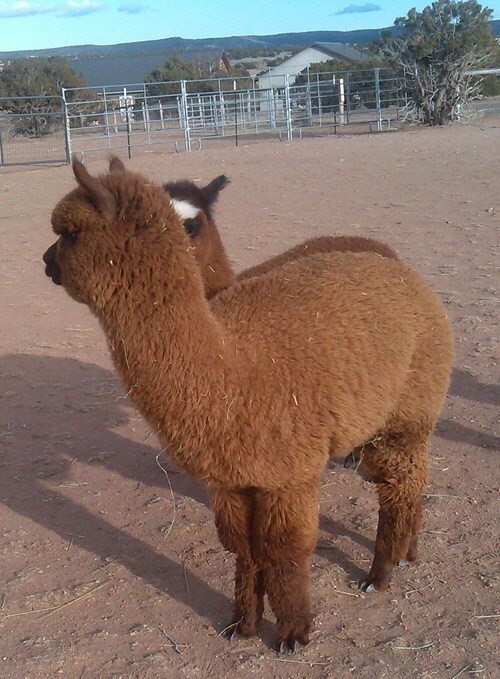 She has an amazingly long staple (SOP for Maggie's cria) and a very nice crimp style. And they just don't get any sweeter than our River! Although she is primarily brown, she has developed a couple of grey spots and we are choosing breeding partners for her to see if she will produce grey. She was bred to our new darling, Greased Lighning. A dark male out of some great grey bloodlines, and we are very pleased with the results. Our fantastic Rocket Man hit the ground late in the morning on July 4th and I felt like the fireworks had started early. He took a blue ribbon at his very first show. Frankly, she has gifted us two wonderful cria so far...Cimarron - who is a spectacular young male with a respectable show record, and now our wonderful Rocket Man - ...she just continues to delight us. Cimarron starts his breeding career this fall...you might want to check him out! River is currently bred to our Shadow Prince, a really gorgeous dark brown boy - we are really looking forward to this baby. Our Cimarron is a scrumptious medium brown male sired by a Challenger of KPR son. He is a solid color, with fantastic fleece characteristics, unbelievable density, impressive fineness, lovely long staple, beautifully bright with a uniform crimp...just a wonderful package. Great conformation, fantastic coverage, a perfect typey head and the sweetest temperament EVER! This boy has his grandpa's "it" - that whatever it is that Vito has...cool, self-assured and absolutely gorgeous. Cim's dam is one of our favorite Vito daughters - she is soooo sweet...and possesses the softest brown fleece I've ever felt. We knew her cria would be special and he "sure nuff" is. 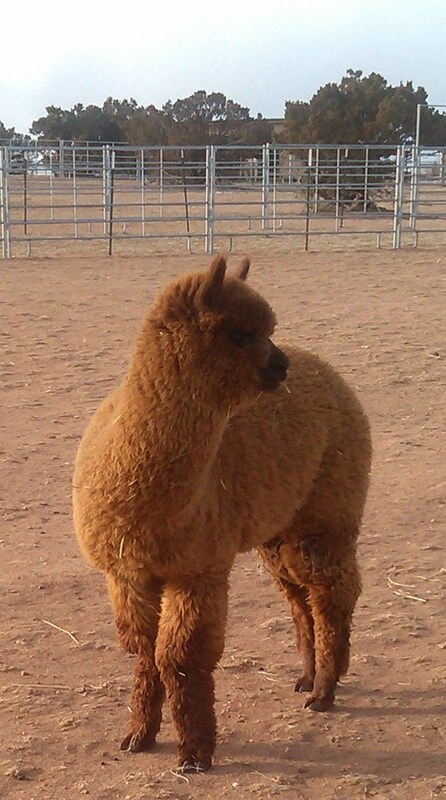 We are so in love with this boy, but he is another one of those alpacas that truly represents our breeding program. He is related to almost everybody. L! We think he deserves a home where he can work so we are offering him for sale at a real bargain price. We proved him last year and he gave us our yummy Ophelia, and we have more on the way next year. can't wait!